Box Text: THE BEAT IS BACK! Grab some friends and your DK Bongos and drum along to a fresh set of all-new, chart-topping tracks like “It’s Been A While“, ”Wish You Were Here”, and “U Don’t Have to Call”! With over 25 new hits, from pop and hip-hop to R&B and dance, you’ll never run out of ways to rock! • Get funky with your friends in a four-player concert quartet, or go head-to-head in the two-player Battle mode. • Discover all-new ways to jam with the always unpredictable Beat-mix mode! • Challenge a friend to Versus minigames, or check out Share mode to see how well you synch up. 01-31-2019 silverbow Description Additional ID: Artwork back ? 57168A Compatible with DK bongos. 01-31-2019 silverbow Box Text THE BEAT IS BACK! 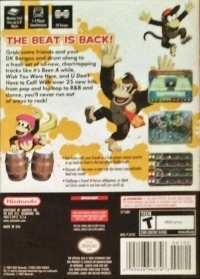 Grab some friends and your DK Bongos and drum along to a fresh set of all-new, chart-topping tracks like “It’s Been A While“, ”Wish You Were Here”, and “U Don’t Have to Call”! With over 25 new hits, from pop and hip-hop to R&B and dance, you’ll never run out of ways to rock! • Get funky with your friends in a four-player concert quartet, or go head-to-head in the two-player Battle mode. • Discover all-new ways to jam with the always unpredictable Beat-mix mode! • Challenge a friend to Versus minigames, or check out Share mode to see how well you synch up. This is a list of VGCollect users who have Donkey Konga 2 in their Collection. This is a list of VGCollect users who have Donkey Konga 2 in their Sell List. 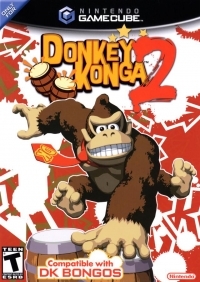 This is a list of VGCollect users who have Donkey Konga 2 in their Wish List.